In the November issue of Weight Watchers magazine, we’ve gone baking crazy. Five clever members have created healthier bakes, and we’ve put the one you voted as favourite in our Facebook poll on the cover. 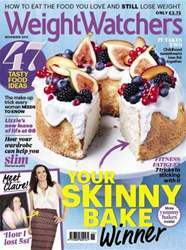 Plus, there are loads more delicious food ideas, and fab stories from a whole host of amazingly inspiring members. After losing both his parents, grief led to Simon gaining a lot of weight. With love and support from his friends, he’s now 6st lighter. Being determined to wear a very special dress was Claire’s motivation to lose more than 5st. Husband and wife Adam and Victoria proved weight loss is better together. And Lizzie found a new lease of life in her 60s, and now feels years younger. It’s time for treats! From chocolate cake to lemon meringue pie, members have created clever versions that let you indulge but still stay on track. We’ve decided America shouldn’t get all the autumn fun, and created a Thanksgiving meal, Weight Watchers-style. Blogger Laura Kettle investigates how the latest kitchen gadgets can create delicious, plan-friendly meals. Plus we’ve got tonnes of ideas for dinner and lunch, and some fun Halloween treats, too. It may be getting colder, but that doesn’t mean you have to start bundling up. Blogger Betty Pamper gives us her pick of autumn and winter looks that are warm and stylish. Plus member Verity gets a masterclass in contouring – the clever face-slimming cosmetics trick – from make-up artist Carolyn Wren. Neuroscience consultant Dr Jack Lewis has created a brain-training plan to boost your weight-loss, while psychotherapist Anjula Mutanda reveals the importance of the clothes you wear and the impact they can have on your mood. And we reveal the seven steps that will help even the most committed fitness-phobe get more active.